This is a blog about computer and electronic gadgets and anything in between. I am making this blog because i want to keep people updated in the world of tech. Xbox 360 to be released in October/November? Details on the new Cell chip. Disc format battle for new consoles. The next Xbox will be named the Xbox 360? PSP to be released in March! 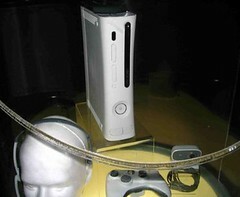 Finally, some leaked pictures of Microsoft's new console the XBOX 360. These pictures were snapped using a camera phone at the Microsoft unvealing party in Los Angelos.